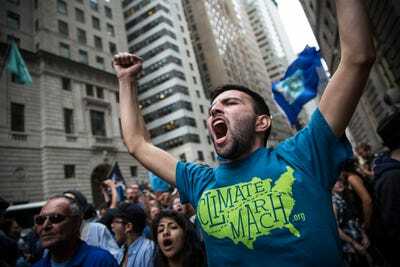 Andrew Burton/GettyProtesters calling for massive economic and political changes to curb the effects of global warming hold a sit in around the Wall Street Bull statue on Broadway on September 22, 2014 in New York City. The cities of San Francisco and Oakland are suing five of the world’s largest energy companies over their role in contributing to climate change and sea-level rise. The federal judge hearing the case is holding a five-hour “climate science tutorial” today – a first for a federal courtroom. The hearing is being compared to the famous Scopes monkey trial in 1925, though both sides in this case agree that climate change is caused by humans. The cities of San Francisco and Oakland are suing Chevron, Exxon Mobil, ConocoPhillips, BP, and Shell over what the cities see as the companies’ role in causing climate change. The cities want the energy companies to contribute to efforts to combat the consequences of climate change, especially sea-level rise, which is a threat to swaths of the Bay Area. Sea-level projections are already beginning to cause property values to drop and forcing residents – and billion-dollar tech companies – to consider relocating in the years ahead. As part of that suit, lawyers representing the five energy companies – as well as those representing the cities of San Francisco and Oakland – must answer eight climate change-related questions posed by the judge, William Alsup. The difference between this case and the 1925 one, however, is that both sides appear to agree that climate change is occurring and is driven by human activity that’s led to an increase in greenhouse-gas emissions. The aim of the tutorial is to help federal courts lay out what scientists, energy companies, and municipalities know – and don’t know – about climate change. Investigations have revealed, however, that Exxon has long been aware of its role in perpetrating climate change – the company has even been accused of deliberately obfuscating the findings of its own scientists for decades. New York State Attorney General Eric Schneiderman is currently investigating whether Exxon may have misled investors about the impact of climate change.